On the 20th October 2016 the Learning Design team attended a Teaching Tricky Topics workshop facilitated by Dr. Anne Pike and Dr. Anne Adams. This case study seeks to record what happened during that process. In order to deliver quality learning and teaching the Open University has adopted an approach to developing its curriculum called OU Learning Design, which supports a consistent, structured design, specification and review process. It provides a simple set of tools and resources that enable a student-activity based approach that puts the learning journey at the heart of the design process. The tools help teams in defining their pedagogic approach, choosing and integrating an effective range of media and technologies, and enables sharing of good practice across the university. 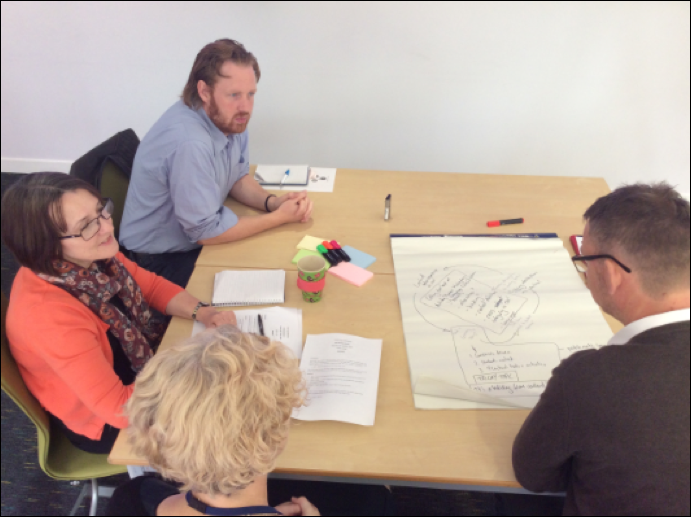 Members of the Learning Design team are available to facilitate collaborative, consensus driven, workshops for module teams across the University. Using a variety of activities and tools they are experienced in developing bespoke workshops that aim to help module teams develop a shared understanding of the pedagogical focus for the module. These workshops are flexible and can be tailored to cater for module or qualification level, MOOCs and BOCs. I had a general idea of how the Teaching Tricky Topic process worked and I think I went into the process with an open mind. I wasn’t sure until we started how the process would help LD. I understood how it could be applied in STEM but was a little sceptical about its ability to be transferable. I had heard before of Teaching Tricky Topics and Threshold Concepts, but had not really engaged with it much and didn’t have any specific ideas about how we could use it in our own practice as Learning Designers. I thought the workshop might provide us with a good opportunity to discuss some of the issues that we regularly face in supporting OU Learning Design and find some ways of addressing those. As a teacher I have taught tricky topics in the past and was interested in how this tool could support teachers to improve their own practice. As a newcomer to the OU and to LD I also welcomed the opportunity for this workshop to inform my own professional development. I had come across the theory of Threshold Concepts, and done some thinking around how they could be applied with relation to digital / information literacy. I was therefore very interested to see how this approach could be used when communicating Learning Design, which like digital literacy is a much debated and misunderstood term. I thought the TTT approach could help us identify the particular stumbling blocks that people have with Learning Design. Establishing a clear and shared understanding of what Learning Design (LD) actually is across the OU has been a problem the Learning Design Team has long struggled with. It is vital to the success of LD that academics and module teams understand this difficult concept clearly. Indeed, once ‘What is Learning Design?’ is understood, the concept can be transformative. Therefore, during the first stage of the TTT workshop it was established that ‘What is Learning Design?’ would be the Tricky Topic. The Identify stage of the TTT Process enabled the LD team to clearly see the Stumbling Blocks that were preventing practitioners from moving on in the workshops. By collecting, clustering and linking the Problem Examples the LD team realised that they had four main Stumbling Blocks to overcome, and they planned to design an intervention to help them to do this. Fig 1. Original working output from the Identify stage. This was subsequently altered during the workshop. I found the identify stage very helpful in starting to articulate in a more structured way what some of the reasons are why people struggle in understanding Learning Design and framing this as a set of Stumbling Blocks. This really helped us think about what the underpinning issues were in developing Learning Design capacity in the OU and started to pave the way for making potential improvements in our practice. What I found particularly powerful about this stage was that we all started out with a different perspective but quite quickly came to a shared appreciation of some of the issues that we face. I used my own recent experiences of developing an understanding of Learning Design to help breakdown the process and identify stumbling blocks. This stage was a really useful opportunity to share ideas within the team, paying close attention to the detail and exploring the wording of Problem Statements. I found the visual mind-map a useful means of capturing our discussions in a structured way, and reaching a shared view. Arriving at a consensus around challenges reflects a Learning Design approach. I’ve found it helpful to refer back to the document we created at the ‘Identify’ stage, and faculty colleagues engaged in Learning Design have also found it of interest. So I think it is of real practical use as a starting point for action. I went with the assumption that the TT itself would be a smaller component. I thought I knew that the Activity Planner Classification Types were problematic but once we got into the nitty gritty of the breakdown it became apparent that the TT was a much bigger concept than just that. Reading and discussing the definitions carefully was important. Collecting and sharing the Problem Statements also made me realise how we were all coming up against similar misunderstandings in our workshops. That sense of a shared problem was very helpful. It was through using the Problem Distiller in the Tricky Topics Tool that enabled the LD team to uncover some potential reasons as to why practitioners were struggling to overcome the Stumbling Blocks they had identified. For example, the Problem Examples indicated there was clearly an issue with the misunderstanding associated to the terminology they were using, particularly in reference to the term Learning Design. This realisation prompted them to share their experiences with each other more closely and they realised that for many practitioners, understandably, the term Learning Design was vague or had multiple meanings, particularly when confused with the more widely used ‘Instructional Design’. Using the Problem Distiller also revealed that the Stumbling Blocks were problematic in that they revealed some essential concepts were alien to practitioners. Unpicking this issue through discussion led the LD team to conclude that there was also a key misunderstanding of the underlying principles or concepts associated with Learning Design. Similarly, it was identified that practitioners often got too bogged down in debating the meanings of the Activity Planner Classification Types which meant they could not move on through the work that was required to be done. Using the Problem Distiller identified that it was most likely this Stumbling Block was causing problems due to the fact that this complementary knowledge, learnt at the same time, was misunderstood. NB. Phrases in italics taken directly from the Problem Distiller. For me, this is the clever bit. It gives you some security that the Stumbling Blocks, no matter their content, are underpinned by the same groups or taxonomy of issues. I’m an experienced teacher but I’ve never had problematic learning explained to me in this way before. I found it very helpful. This is a powerful prompt to thinking about why people struggle with Learning Design approaches and terminology. 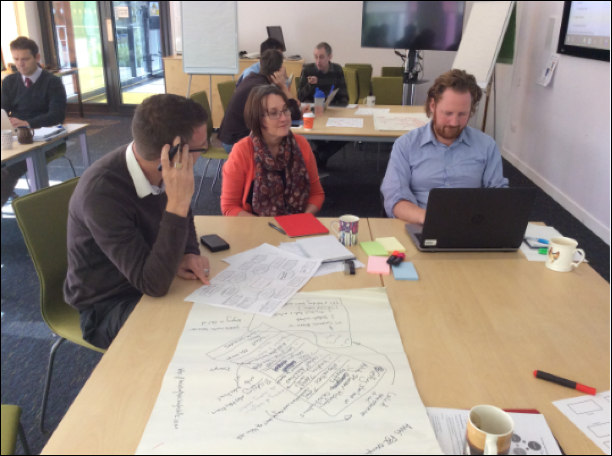 It enabled us to drill down into the reasons for misunderstanding and confusion, and talk about it from the point of view of those involved in OU Learning Design for modules. It was very reassuring to realise that we were all in agreement about the stumbling blocks and useful to take the time to unpick the underlying concepts associated with Learning Design. Looking at the stumbling blocks in relation to a set of different root causes for misunderstandings proved to be a very helpful step. Although I felt that not all the issues we could identify were directly related to the categories of the problem distiller (such as issues of motivation, mindset and attitudes), these nonetheless formed a helpful way of categorizing and thinking about the stumbling blocks and what underpinned these. Once these Stumbling Blocks, and their underpinning reasons were understood, the LD team embarked on building a multiple choice quiz in the online Tricky Topic Tool. It was designed so that each question would attempt to address several of the Stumbling Blocks and so that overall, each Stumbling Block would be addressed at least 3 times. 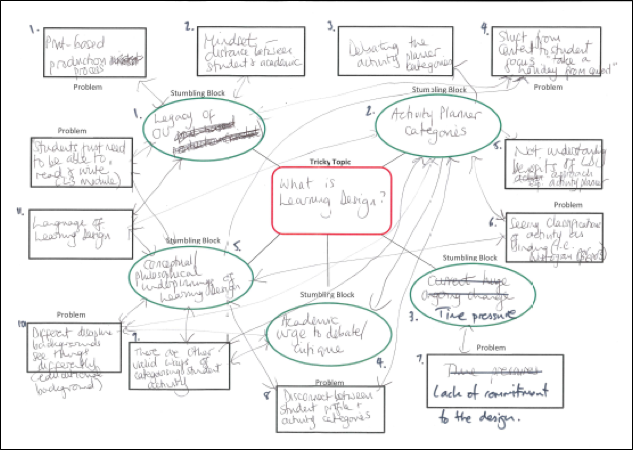 What is the key benefit of the Learning Design process? It provides a free lunch during the workshops. It keeps the LD team in a job. It makes course design faster and cheaper. What is the primary purpose of classifying curriculum using a framework of activity types? To ensure that activities of each type are included. To research the impact of different pedagogies. To create templates to structure course design. Why should this framework for classifying activity types be adopted for Learning Design? This framework was developed by the OU. The Vice-Chancellor said the University must use this framework. Why should practitioners spend time on Learning Design? The module team don’t want to hurt the feelings of the LD team. The module team have plenty of time, so why not? How should practitioners classify activities that do not fall into only one category of the framework? Ignore the activity. It can’t be classified. Change the activity to fit one category only. Classify the activity in the dominant category. NB. Correct answers indicated by asterisk. It was decided that a quick activity that could take place at the beginning of workshops using a celebrity chef cooking metaphor would be appropriate in this context. The idea of the intervention was to ask participants to brainstorm words that they might use to describe the cooking styles of the celebrity chefs Heston Blumenthal and Jamie Oliver. Fig 2. Screenshot of slide 1 used in LD workshop. 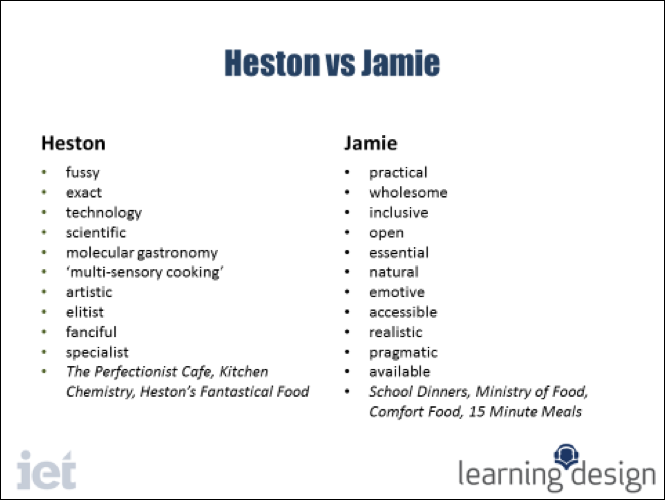 Then, the LD team could highlight certain words, and further develop the metaphor that it might be beneficial to think about the Learning Design workshop in terms of Jamie Oliver’s approach to cooking, rather than Heston Blumenthal’s. They wanted to develop the idea that Learning Design is more about being practical, realistic and pragmatic, rather than fussy, fanciful or specialist. The LD team would emphasise that (while there was a place for a scientific or exact approach (Heston) to module design) the Learning Design Workshop was more about developing a broader, higher level pedagogical overview and practitioners should be careful about getting bogged down in too much unnecessary detail about specific activities. Indeed, that this thinking would be dealt with later in the design process, with Instructional Design as part of a TEL Design workshop. Also, by establishing this metaphor early in the workshop it could be referred back to, particularly during the often problematic Activity Planner Classification Types section, to emphasise in a non-confrontational way the idea that building an early view of the pedagogical spread of intended activities was an aspirational task, based on something that would be fit for purpose and did not need to be exact at this point. In other words, an approach Jamie Oliver might take. Developing the quiz provided an opportunity to think through from a learner (i.e. OU course team staff) perspective what the underlying principles are that we really want to get across, and to address some of the common misunderstandings. It was a fun process which helped us start to work out how we can communicate OU LD more meaningfully. My one reservation is that LD is a complex process and a quiz which suggests there is only one ‘correct’ answer may not fully do it justice. It would need to be supported in practice by discussion, clarification and ideally some further information, i.e. an online quiz by itself is not enough. In terms of coming up with an intervention, the ‘celebrity chef’ metaphor is a good way in to Learning Design for workshop participants and I’ve seen it work really well in practice. It engages people with the concept of LD in a light-hearted way, without getting bogged down in laborious explanation. I found the development of the quiz to be the most enjoyable stage of the Teaching Tricky Topics process as this was the first point where we started to actually develop something tangible that would help us address some of the issues that we had identified in previous steps. In particular, I felt that the structured approach to thinking through the stumbling blocks, problem statements and using the problem distiller contributed to a very specific and well thought-out quiz. I did feel that we needed to spend a bit more time on this stage as coming up with effective questions and choices proved to be quite a tricky process in itself. I’ve used this intervention repeatedly and, in my opinion, with good results. The idea for the intervention grew from a presentation I gave several months ago but it needed development to be effective. What’s important is that now I understand ‘why’ it works, because I am able to articulate to myself and others the problematic learning it is seeking to overcome. In my teaching practice I’ve found the use of metaphor to be very effective in explaining difficult concepts to students. I’d like to see us build the quiz into something we can use to evaluate our workshops in the future. There are many possibilities! I’ve also found this metaphor helpful in setting the scene at a workshop and providing a reference point for many activities. In fact the cooking metaphor extends well with examples of using different recipes or techniques to bake a cake. The message being that there is no single “right” way of doing Learning Design – it’s about the balance of ingredients and the method of combining them.